Num 15:15 As for the congregation, there shall be one statute both for you and for the alien that lives with you, a never ending statute throughout your generations; as you are, so shall the alien be before Yahuah. Num 15:16 There shall be one law and one ordinance both for you and for the alien that lives with you. Clearly there is a set of life instructions from Yahuah to His people, beginning with the Hebrews and adding in the gentiles who also follow Yahuah. All who worship Yahuah are to adhere to His Dabarim, or “Words”. There is one “congregation” and one set of instructions for all who worship Yahuah. The instructions, or “Laws”, never change, because Yahuah is the same forever. That is why His instructions are forever, because He is the same yesterday, today and forever. Do not be mis-taught. The Words of Yahuah are always correct. Men mis-lead the sheep. Please examine this example of wrong teaching from the Billy Graham Evangelical Association. This “answer” from Mr. Graham is intended to break Torah and allow eating unclean animal flesh. “In Acts 10:9-16, Peter was informed by God through a vision that he was not to reject the use of certain animals for food on a religious basis. The apostle Paul also writes, “For everything God created is good, and nothing is to be rejected if it is received with thanksgiving, because it is consecrated by the word of God and prayer” (1 Timothy 4:4). The answerer, which I assume was Mr. Graham, takes 1 Timothy 4:4 out of context, and also does not understand what the word “food” means to Yahuah. There is “food that is eaten”, which is clean food, and “animals that are unclean” which can be sold to non-believers. In Genesis 6:21, Yahuah instructs Noah to “take all food that is eaten” (this will be “clean” food animals) to store for food to eat when he and his family are aboard the ark. Obviously, Noah knows what food is permitted to be eaten, and what is not permitted, because Yahuah stipulates “food that is eaten”. Food that is “not eaten” can be given to people who do not follow Yahuah. Deuteronomy 14:21 – You may give it to the stranger (resident alien, foreigner) who is in your [city] gates, so that he may eat it, or you may sell it to a foreigner [since they are not under God’s law], but you are a people holy (set apart) to the Lord your God. And immediately next, in Genesis 7:2, Yahuah instructs Noah to load seven pairs of clean animals, and two pairs of unclean animals, of each kind, onto the ark for preservation from the flood. 1 Timothy 4:3 forbidding to marry, saying to abstain from foods, which God created for partaking with thanksgiving by the believers and those knowing the truth. So the Timothy scripture is speaking of “latter times”, like today, when deceiving spirits will lead people from the faith (away from obedience), forbidding to marry (Catholicism/Hinduism – 2 billion adherents), abstaining from food (Only clean animals were considered ‘food’ when Timothy was written, but this refers to abstaining from meat in general ) so veganism would certainly abstain today from animals which are scripturally called “food”, and from meat in general. The last statement of Paul – “because every creature of God…” does not imply that unclean animals are food for believers. It takes for granted that people know that only clean food as defined by Yahuah is to be eaten, as only clean food is “of God”. Unclean meat is not “of God” because it is declared fit only for unholy people in Deuteronomy 14:21, above. Our clean meat is set-apart, too, obviously. It’s part of the holy life that makes us His “peculiar people”. Psa_135:4 For the LORD hath chosen Jacob unto himself, and Israel for his peculiar treasure. Ecc_2:8 I gathered me also silver and gold, and the peculiar treasure of kings and of the provinces: I gat me men singers and women singers, and the delights of the sons of men, as musical instruments, and that of all sorts. Tit_2:14 Who gave himself for us, that he might redeem us from all iniquity, and purify unto himself a peculiar people, zealous of good works. Therefore, the writer of Timothy (Paul/Shaul – the “Pharisee of Pharisees”) refers only to clean animals, as only clean animals were considered ‘food’. 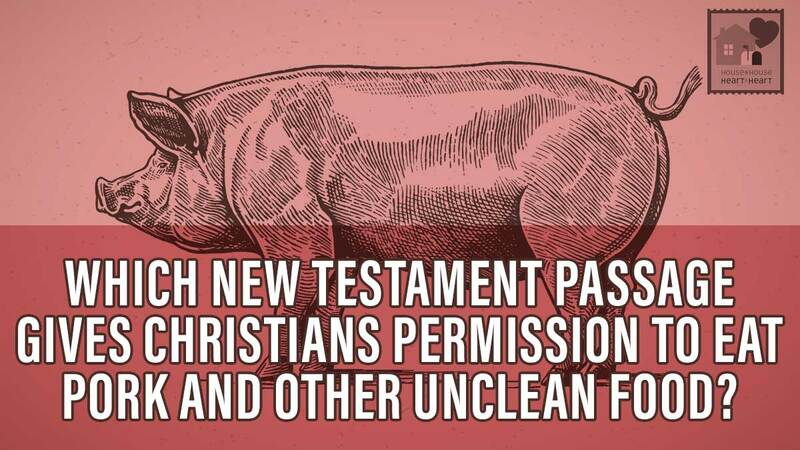 Unclean animals were never called “food”, and even Noah knew what was for eating and what was not, even though no teaching on clean and unclean food is present in Genesis up to the closure of the Ark. Your thoughts in comments are welcome. We all are at some undefined place in our relationship with Yahuah, and our wisdom and understanding will differ, for sure. Therefore, we must be kind, patient and accepting of our differences. Please comment as you see fit. If you think I am wrong, I suggest you comment. If you have an observation in the Words, make the comment. Believe this – you are a “different breed of cat” or you would not be reading this. There are few of us, as is fitting, for strait is the gate and narrow the way that leads to life, and few find it. You are special, believe that. You are unique; exceedingly rare and holy in the eyes of Yahuah. “…whosoever shall do and teach these laws shall be called GREAT in the kingdom of heaven.” – Yahusha, Matthew 5. It pleases Yahuah when you desire to be great in the Kingdom of Heaven, because that greatness is a gift He offers you. That you are wise enough to desire and pursue His offer greatly pleases Him. Satan will tell you that you are prideful to desire greatness in heaven, that “god” wants you to be humble, etc. Well yes, humble spirits are beautiful to Yahuah, but trust the Word, not your thoughts. He rewards His faithful servants. Be a faithful servant. Trust the Word – not your thoughts. DaBarim 12:2 Destroying you shall destroy all the places where the nations which you are dispossessing served their gods, on the high mountains, and on the hills, and under every leafy tree. DaBarim 12:3 And you shall break down their altars, and shatter their standing pillars. And you shall burn their Asherahs with fire. And you shall cut down the carved images of their gods, and shall destroy their names out of that place. DaBarim 12:4 You shall not do so to Yahuah your God. DaBarim 12:5 But you shall seek to the place which Yahuah your God shall choose out of all your tribes; for you shall seek His dwelling, to put His name there. And you shall go there. DaBarim 12:6 And you shall bring your burnt offerings there, and your sacrifices, and your tithes, and the heave offering of your hand, and your vows, and your freewill offering, and the firstlings of your herd and of your flock. DaBarim 12:7 And you shall eat there before Yahuah your God, and shall rejoice in all that you put your hand to, you and your households, with which Yahuah your God has blessed you. DaBarim 12:9 For you have not come to the rest and to the inheritance which Yahuah your God is giving to you. DaBarim 12:11 And it shall be the place which Yahuah your God shall choose to cause His name to dwell there, there you shall bring all that I am commanding you, your burnt offerings, and your sacrifices, your tithes, and the heave offering of your hand, and all your choice freewill offerings which you vow to Yahuah. DaBarim 12:12 And you shall rejoice before Yahuah your God, you and your sons, and your daughters, and your male slaves, and your female slaves, and the Levite within your gates because he has no portion or inheritance with you. DaBarim 12:14 but in the place which Yahuah shall choose in one of your tribes, there you shall offer your burnt offerings, and there you shall do all that I command. DaBarim 12:15 Only with all the desire of your soul you shall sacrifice and shall eat flesh within all your gates according to the blessing of Yahuah your God which He has given you; the unclean and the clean one may eat of it, as of the gazelle and as of the hart. DaBarim 12:16 Only, you shall not eat the blood; you shall pour it as water on the earth. DaBarim 12:17 You are not able to eat the tithe of your grain within your gates, and of your new wine, and your oil, and the firstlings of your herd and of your flock, and any of your vows which you vow, and your freewill offering, and the heave offering of your hand. DaBarim 12:18 But you shall eat it before Yahuah your God in the place which Yahuah your God shall choose, you and your son, and your daughter, and your male slave, and your female slave, and the Levite who is within your gates. And you shall rejoice before Yahuah your God in all that you put your hand to. DaBarim 12:19 Take heed to yourself that you do not forsake the Levite as long as you live on the land. DaBarim 12:22 Only, as the gazelle and the hart (an animal, not a heart organ-jd) are eaten, so you shall eat of it; the unclean and the clean (people who are ceremonially unclean at the time-jd) may eat of it alike. DaBarim 12:24 You shall not eat it; you shall pour it on the earth as water. DaBarim 12:26 Only, your holy things which you have, and your vows, you shall take up and shall go to the place which Yahuah shall choose. DaBarim 12:27 And you shall offer your burnt offerings, the flesh and the blood, on the altar of Yahuah your God; and the blood of your sacrifices shall be poured out by the altar of Yahuah your God; and you shall eat the flesh. DaBarim 12:28 Take heed to listen to all these Words which I am commanding you, in order that it may be well with you and with your sons after you forever, when you do that which is good and right in the eyes of Yahuah your God. — Remember Numbers 15: ONE LAW FOR ALL, Hebrew and Gentile, whoever follows Yahuah submits to the same set of instructions. No exceptions. DaBarim 12:30 take heed to yourself that you not be snared to follow them after they have been destroyed before you; and that you not inquire after their gods, saying, How did these nations serve their gods? And I shall do so, even I.
DaBarim 12:31 You shall not do so to Yahuah your God; for everything hateful to Yahuah, which He detests, they have done to their gods. For they have even burned their sons and their daughters in the fire to their gods. DaBarim 12:32 All the things that I command you, take heed to do them and you shall not add to it, nor take away from it. — This means no matter what I say or any other human being ever says, ONLY the Words of Yahuah matter, and obedience to His Word is required. That is how each of us will be measured, so stick to His measuring rod – His Words and no others. Regarding homosexualism, which will come up when we are commanded to kill them, bear in mind that Yahusha commanded that only those among us who have never transgressed the law have the authority to execute the the abominations. And since all of us have sinned, none of us can obey the law to execute those specified for execution by Yahuah. I haven’t eaten pork for many years, I’ve been ridiculed at times from family and friends. I’ve stopped trying to show them there error in the NT Luke interpretation. I’m country grew up on a farm and farmed all my life, swine have no sweat glands to remove the poison these scavengers ingest. Gives me a sense of comfort to know there are others such as I.
I’m with you, Jay. I grew up hosing down the barn after milking the cows. And my hot-smoked pork ribs are the best of the best :). But if Yahuah tells us not to eat pork, then I am happy to give it up. When I finally learned that the food prohibitions actually applied to me, I gave all my pork to my former pastors son-in-law 🙂 It was two big coolers filled with the mess. Pork never did digest well in my gut, and I’m sure now that it is a harmful food, but I think that Yahuah is just looking for faithful servants in some of His commands. How are you doing with the Sabbath, Jay? If you are comfortable sharing, do you honor the Sabbath, and if so, what is a typical Sabbath day like for you?